Since 2015 Idea London has been the London location for TADHack Global as well as TADHack-minis with the support of UCL (Dr Alistair Moore and Niall Roche), ipcortex (Rob Pickering and his team), and of course Idea London. Its an ideal, pardon the pun, location for TADHack: the facilities, location, and amazing diversity of people in and around London can not be beat. UCL’s IoT Lab is also based in the same building as Idea London so we are able to play with their IoT toys Listed below are some of the hacks presented at London over the years, go to the TADHack Youtube Channel to see all the 60+ hacks. From these hacks companies have been founded, people have found their dream job, and students have been able to join successful start-ups. For 2018 Rob and his team from ipcortex will be running TADHack London. Niall will have the UCL IoT Labs on hand to mash-up with the TADHack Global sponsors: programmable telecoms (VoIP Innovations) and Ethereum (Status). IDEA London has a small IoT lab space to help hacks that want to use hardware as part of the solution. We previously had a great hack that involved a Philips Hue so why not make your idea more interesting by using a Raspberry Pi or even an Arduino and a bunch of electronic components and sensors. The lab has some cool devices such as an Occulus Rift, Amazon Echo and Firestick, Bluetooth iBeacons, a Google Home and some 3D printers and even a laser cutter! Please get in touch with us if with your idea and the team at IDEA London will do their best to help to facilitate. 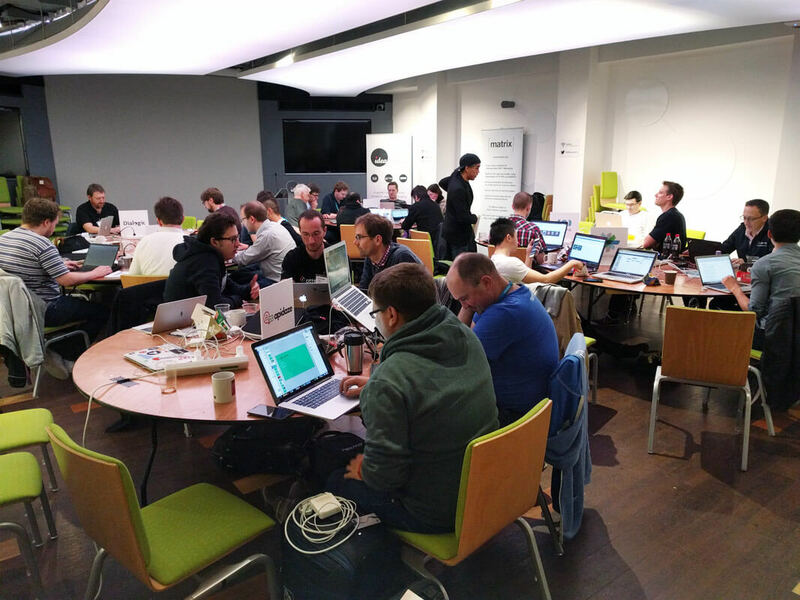 Register for TADHack London here, 13-14 October. You’ll have fun, learn lots, and perhaps even change the world, or at least your local community, with your hack. One Vision used Temasys by Leslie, Mike, and Daniel. An application that supports Holistic self using Temasys. An original take on personal organization. Apologies to the team, but I want to highlight this hack as an example of the high quality bar, where a hack this good just missed out on a prize. PhoneGuard used Apifonica by Ousama, Michael, Mark. A system for charging unsolicited callers a fee to call you, solving one of the ideas proposed by Dean Bubley. Won the Apifonica global prize. state of the chart by Emma, Gareth, Robert used Matrix and Vidyo. A tool for remote design meetings. Web based video calling with the ability to covert pen-on-paper sketches to shared click-and-dragable drawings. Won the location prize as well as Vidyo global prize. Pushtime by Aviral used Matrix. Syncs your phone to your computer over the secure, end-to-end encrypted Matrix protocol, using an Android app on one end and a Chrome extension on the other. It works cross platform, and with multiple devices at the same time too! Won the location prize as well as Matrix global prize. Culturoo by Gladwin, Chris, Awais, Jardin, Immaneul used Temasys and Vidyo. A web calling platform that promotes cultural learning through compelling suggestions for communication. This was the first hackathon for many of the team, and they won the location prize, and here is a write-up of their experiences. Polite.ai by Rob, Joe, Lucy, Mercer, John used Matrix. It was focused on nailing the troll problem in real time chat. Won the location prize as well as Matrix global prize. Its also now an open source project. Project Clearwater over RINA by Matt, Yin. Implementation of Project Clearwater IMS core running over RINA network architecture. Won the ArcFire challenge. Apifonica Node.js contribution by Steven and Lily. A node library to make accessing APIfonica easy. Won the Apifonica global prize. Rome by Steven and Lily Madar used Apifonica. “Reach me anywhere” – a way of contacting someone, in a variety of ways, depending on the time of day. Won the Apifonica global prize. E-Advisor-Voice by Roslyn and Dalton. E(lectronic) Advisor is a voice digital assistant that helps you repair, recycle, or sell your abandoned electronics. It is live on Amazon Echo in the US and UK with Germany pending. E-Advisor is also live on Google Assistant. Our hack allows anyone in 60+ countries to access E-Advisor’s service by calling a local phone number. Stephen Sale from Analysys Mason created “My First Hack” a primary research automation service using Telestax and Dialogic. This was his first ever hack, we recorded it on Saturday as he had family commitments on Sunday. But in only a couple of hours with coding skills long forgotten he created an application that would help him in his work. He won the Telestax/Dialogic prize for best first hack. SPAN Services created the hack Mayday using Telestax and Dialogic. Mayday is an application developed over the RestComm platform, which provides features such as audio/video call, chat, annotation and co-browsing. The application supports iOS & Android operating systems and the Web. The demonstration of this application is implemented using an e-commerce electronic store application, where the use of Mayday application has been conceptualized. They won the Telestax/Dialogic prize for best customer Service innovation. Here a link to their remote entry. Torrey Searle demonstrated the Integration of Midori into a Cisco Spark room with many impressive capabilities and won the Cisco prize. Here’s the link to his remote submission, parental discretion advised. Steven Bakker, Timo Uelen and Bart Uelen created the hack Babelonio, a mulilingual chat using decentralized messaging. Resources used included Matrix, speech recognition and Google Translate. They won the Matrix prize of a Phantom X Hexapod Mk3. Sebastian Schumann’s hack ‘Contact Sentry’ using Telestax Restcomm and Dialogic XMS. It provided inbound call filter based on network address book and programmed white-list through Slack. He won the Telestax/Dialogic prize for best overall hack. Roderick Hodgson and Alex Francois created the hack Distillate using Telestax, Dialogic, Apidaze. The hack enables you to have a record and keep track of the key topics in your conversations. Receive an SMS with keywords from your WebRTC audio conversations. They won both the Apidaze prize and Telestax/Dialogic prize for best use of AI. Mike Dauphinais created the hack Cupido using Cisco Spark and Apidaze. Its a merge conflict manager: in case of local changes that might create a merge conflict, a room is created to discuss about it. He won prizes from both Cisco and Apidaze. Brant Wang & Sacha Nacar created the hack BigBro using Cisco Spark. An anti-cyber-bullying bot for chat rooms. They won the Cisco prize. Roslyn Scott presented how her business Mobicycle can be extended by the hack Repair Clinic using Apidaze, Cisco Spark, Telestax, Dialogic. So people can repair their electronic devices with help from their experts. She the Cisco prize. Next presenter was Roslyn’s 15 year old son Dalton with his hack Jerry, using Telestax and Dialogic. Which turns your favorite applications ‘data-less’. He won the Telestax / Dialogic prize for best youth hack. And is the youngest TADHack winner to date. And we also have another first with mother and son winners. I would also like to mention the hack ‘confidant’ by the Founders and Coders WebRTC course students: Tasnim Sultanah, Mireia Sangalo Tomas, Ivan Gonzalez, Jack Tierney, Eleanor Re’em, Virginie Trubiano, Robert Francis, Katherine Bowler, Andrew MacMurray, Jack Murphy, Elias Malik, Francesco Moro, Sam Houston, Owen Turner-Major, Eoin McCarthy, and Ben Gesso. Which used of course WebRTC, Tropo, Telestax and Dialogic. Confidant is a hack which comes from a real life requirement brought to them by a Charity and an NHS Trust who want to enhance youth mental health counseling services using a community of volunteers on related university courses. It demonstrates the feasibility of using WebRTC to provide better access to support services and at the same time give supervised students credit for professional experience gained by volunteering their time. They’d only just learned about WebRTC and were creating a hack they intend to bring to market. Igor Pavlov, founder and CTO of LyteSpark, and a regular at these events as this was his 3rd TADHack. Showed the LyteSpark Slack App . When you get into a chat session where jumping onto a video chat makes more sense, the LyteSpark app jumps in with a suggestion. LyteSpark has just launched a few weeks ago, yet that did not stop Igor hacking. Its a great example of how communications can be made more effective. Messaging is fine, but sometimes talking so so much quicker, and that’s what the LyteSpark app does. You can download the Slack app here. Another TADHack regular is the master hacker Sam Machin, who has recently joined Nexmo. Sam’s hack, DxRTC, was a great showcase of using the data channel of WebRTC, to enable 2 peers to find each other by swapping their GPS data. It enabled Sam to have a play with a number of data channel options, and create a sweet little application. Learning is an important part of every hackathon, and Sam shows its important to never top learning, even if you’re at the top of your game . Be My Friend was created by the team of Justin Grierson and Matt Williams. It used the Tropo as well as Telestax and Dialogic to capture voice and do sentiment analysis on the voice. The idea is to provide support to people with mental health issues. Matt did another amazing coding feat within the browser. Because today IVR’s generally do not support video he coded an application server in the browser – yes, you heard that right. Faiz Rasool and Joel Barnett presented “Education Studio Live” using the resources from Telestax, Dialogic and Tropo. Its an Online Virtual Class room based learning platform. It uses face and eye detection to determine if someone is not focused on the class, and alerts the instructor to get the student better engaged. Send what you see was created by Niall Roche and Daniel Fozzati. The hack used CiscoSpark to capture text using phone camera and sending the text (not the image) to a Spark room. It enabled Niall to explore a number of issues with the Spark Java API in Android. Last, but definitely not least we wrapped up TADHack London with the Vaipo App by Siddartha Pothapragada who used Tropo. The application enables video chat connection between two registered users of the application seamlessly. User can use his phone number to register with the Vaipo cloud service. (or) Users can also use their gmail IDs / facebook IDs to register with our backend. Users can enable Video chat during a regular ongoing PSTN call. This was a great hack to kick-off, showing real-time video over WebRTC from a drone in Bletchley Park with a Raspberry Pi blu-tacked (yep that’s correct blu-tacked) to it to run the WebRTC stack. We’ll have separate weblogs on all the hacks going into the implementation details, GitHub repositories, etc. At TADHack we allow some showcases, these are near commercial or commercial cool services from small companies that need help getting broader awareness of the good work they are doing related to a sponsor’s technology. Viblast has an interesting WebRTC based peer to peer content delivery network. This was a fun hack, ably demonstrated by Andrey receiving an honorable mention from Dialogic. It analyses a video stream to check if the viewer is watching, and if not sends an alert. Andrey’s demo is so straight-faced as he demos a student falling asleep, its classic. His hack uses the Dialogic XMS media server and the Oracle WSC. Wootag is an interactive video provider, that is they tag videos at particular points with calls to action, and for TADHack they made one of them a ‘click to call’ with Apidaze. Wootag has experimented with click to call services in Indonesia and experienced call through rates as high as 22%, which is amazing compared to western markets. They were a joint winner of Apidaze prize ($500). Sam was showing off his full stack programming skills, with an iOS app, and backend logic using the Truphone API. Its taking calling back to the days when people called places, and if a mobile phone is near a bluetooth beacon the call is diverted from the beacon’s number to the mobile phone number. This hack won the Truphone Prize of $1000. Guilherme gave a good practical demonstration of how easy it has become to create information services for phone numbers. Igor was great, not only did he work on his hack, he helped several other hacks. Collaboration is an important part of TADHack. He showed how within a couple of hours he had extended the LyteSpark service to any phone. He was a joint winner of Apidaze prize ($500). Joris is leading the using of WebRTC to enable communications to be much more deeply analyzed, for example in interviews, but also in patient / healthcare-provider communication. He was excited the the potential Kandy.io has in enabling him to break from his browser applications onto mobile phones, and he explained how he will be developing his commercial app on it. Joris is a joint winner of Kandy prize ($500). Aswath announced the technical review phase of ffonio.in, a text to voice and video app. Media Interactive provide a complete elearning platform. They focused on the collaboration aspects of their platform using WebRTC and Dialogic XMS media server to ensure good quality experience on their service. They were the winners of the Dialogic prize. Nice contextual call dispatcher for mobile agents. Think of it as a WebRTC automatic call distribution, or an Olark for voice. The hack used Telestax / Restcomm, Voxbone and Nexmo. Sacha was a joint winner of Telstax prize ($500). The was definitely the most slick remote video. A similar configuration to Rob Pickering’s hack with a Raspberry pi using WebRTC for the video and using Matrix.org for the signalling to control the robot. They won the Matrix prize a Parrot Bebop Drone. Sebastian’s hack was built using Telestax Restcomm and Nexmo. It is a great demonstration of how open source and telecom APIs have revolutionized service development. Something that once cost millions and could take over a year to build, is now possible in 14 hours. This hack was a joint winner of Telestax prize, $500. Neil’s hack was a great mash-up of the physical (individually addressable LED light strip) and using a Matrix room to control the LED lights. The applications of this hack are endless, e.g. corporate interactive signage , at parties, etc. Neil won the University College London prize of $1000. These internet developers were wowed at the potential of WebRTC and applied it to their co-browsing service, they are looking forward to doing much more with WebRTC after their experience at TADHack. They were the joint winners of Kandy.io prize, $500. Matt Williams pulled off a coding feat that even impressed Matt Hodgson (who at the WebRTC event in December, pulled off a coding feat while presenting). Matt gatewayed the IMS world with any ‘matrixed-in’ communication island, using WebRTC for the media. Matt was a winner of Matrix prize a Parrot Bebop Drone. This pitch showed even the core of telco networks are going open source. This was a more industry focused hack, but we’re hoping for TADHack Global (at least in Lisbon) we can have a private LTE network to hack on, where developers can get in and play with the guts of the network. But more on that later.